The prospect of weeks ahead with pain and without sleep would have been horrible beyond words. I am so glad to hear that you are through the worst of it. May you never have to be in that situation again. There’s nothing worst than not being able to sleep due to pain! Poor Elizabeth! I feel your pain. Here’s to the bright side of life! I really felt for you as I read your post and am so glad that this awful time is mostly behind you! I love that you were able to translate some of your experience into the quilt in a way that’s both visual and metaphorical. I like it with the light to the top – the pattern on the dark fabric is fantastically turbulent, and as the dark sections get smaller I like the optimistic reading that those waves are gradually subsiding! 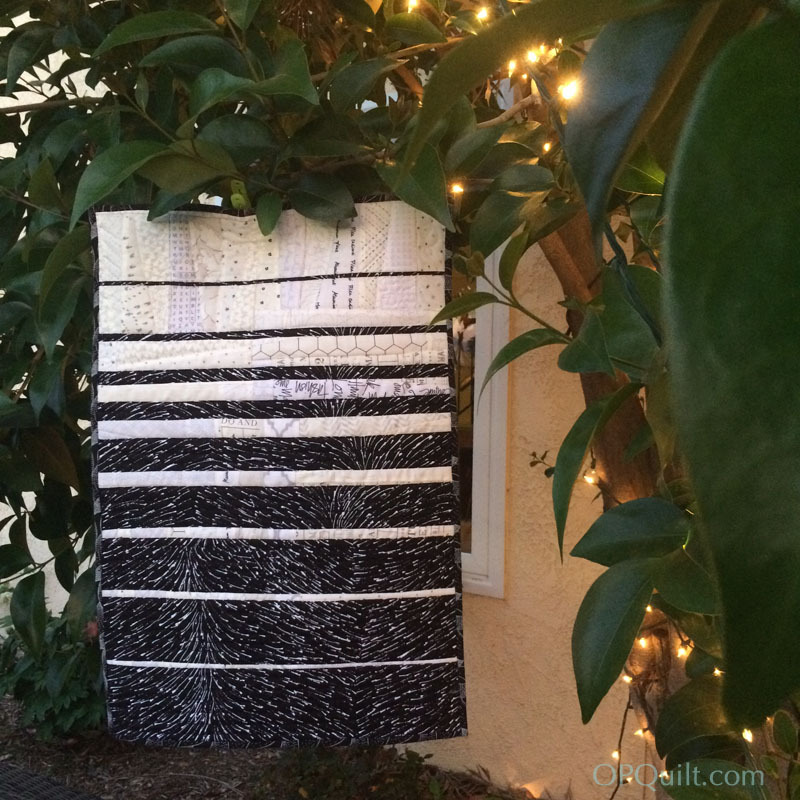 Great post, love your quilt. Expressing our lives in fabric is an amazing thing, many others don’t have such a form of expression. So sorry for your pain, I can truly empathize, as I’ve had two bad leg breaks, and understand the difficulty of the recovery process. For someone whose happiness is in their hands & use of them to create—-unimaginable. Good job, my friend!!! You’ve been thru the worst of it & it’s only going to get better and better! Wishing you health & healing! I’ve never had a surgery or post-surgery experience that even comes close to what you’ve shared here. It sounds perfectly dreadful… I had no idea. It sounds like you’ve only “endured” to reach this point. Awful. I’m sorry you had to go through it, and glad you had a supportive husband. Personally, I wouldn’t be able to look at a quilt that was a result of that pain and isolation. Still, it seems to perfectly express your distress. Should I say, “That’s a well done quilt”? Seems a bit like rubbing salt in the wound. Out of all the bad times, a beautiful quilt has emerged. You have made the most out of a miserable situation and it turned out so well. It captures your theme perfectly and using those left over low volumes to reflect the popcorn ceiling was genius! Beautiful. I saw your sneak peeks on IG and was thrilled that you were able to use extras from the pig quilt. Gives it all an extra layer of meaning. I think we sometimes can’t see the light until we’ve been in the dark to know the difference. What a powerful quilt to recognize this time in your life. And the either way is up totally works. I had no idea what all you were going through. Your quilt is a very meaningful interpretation of your experience and sharing your story enables us as readers to ‘feel’ your pain. I’m wishing you a total recovery and a pain free future. You certainly captured the experiences of pain and hope, both visually and in words. It’s one a.m. and I sit in my recliner recovering from wrist surgery. Unable to sleep and unable to sew and unable to play my piano (I’m a pianist in my real life). Thank you for writing this; it gives me hope that there is light shining through those dark times. As I’ve been awake (a lot!) I’ve been looking at quilts on the Internet and it does give me joy to begin planning my next project! Thank you for being an inspiration even through the difficult times! And through it all, you knew, deep down, that the fog of pain would, finally, lift. And it has!!! This little quilt is such a poignant reminder of “the surgery” and years from now it will still be a reminder – so sweet. Well done and well done! Your quilt is eloquent in its simplicity, and as always, your writing is so descriptive that I can nearly feel your pain. Sounds like the light is indeed coming through that darkness! Phew! Great to see it represented here. Best wishes for the rest of your full recovery! Looks like you have ambidextrous light and darkness my friend! I love this little trick with your Four In Art quilt. Sometimes we are the same way in life, a little darkness and a little light, all blending into each other. The fact that you used the white leftovers from your piggies quilt makes this quilt have another meaning too….. It’s friends in life that crowd out the darkness. I love the simplicity of the design. I find it amazing where the artist finds inspiration. This mini quilt says so much. Is the glass half full or half empty? What you were able to create under less than workable conditions gives credit to your passion and desire to move ahead. We, too, have popcorn ceilings and like the texture of the fabric print you used to pass that view along. The write up is well done and enjoyable to read.